Arranged, recorded, mixed, designed, developed, and produced by Tom Pixton. These famous old North Sea tunes were championed by fiddler Tom Anderson, Aly Bain’s teacher. We first heard them at Pinewoods in 1997 as played by the inimitable Arlene Leich Patterson, who also studied with Tom Anderson. 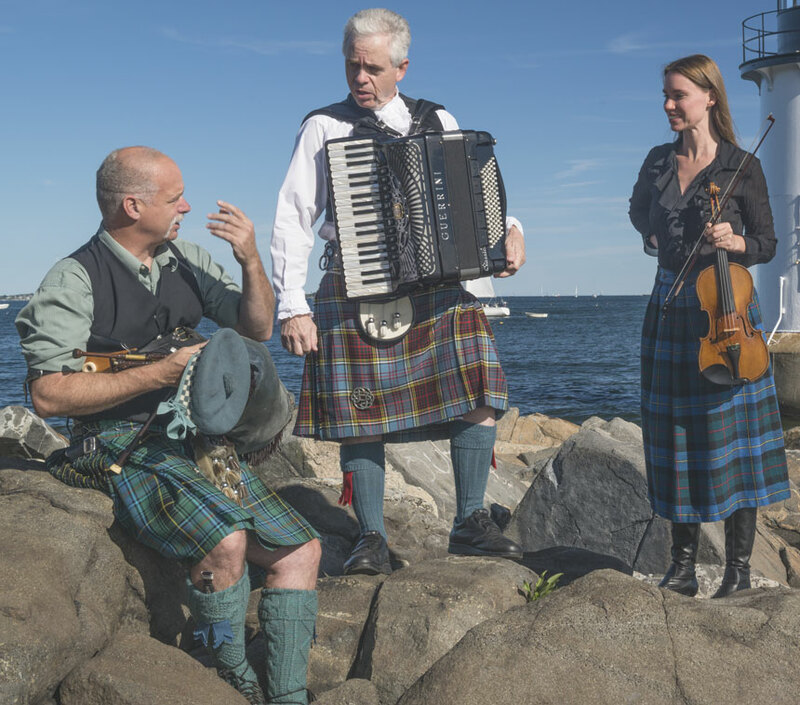 There are very few true Scottish jigs—it was really an old Irish style of music. Mike loves to play these as a set on the low A small pipes, and while Frasier’s and Kenmurra’s are likely of Scottish origin, Paddy Carey surely isn’t! This set begins with a mournful old air made famous by Robert Burns as “Ca’ the Yowes to the Knowes.” We segue into two of our favorite 18th-century strathpey tunes, and end the set with two of the most famous old Scottish reels, adored by fiddlers and dancers everywhere (well, everywhere WE go!). This tune first appeared in print as “Sgéal M’Athar” (My Fathers Story), composed by Carl G Hardebeck in Belfast in Gaelic League circles circa 1908-1912. It has since become a favorite among pipers everywhere. We return it to it’s lyrical origins in our arrangement with Mike on the D small pipes. The striking air “I Will Go Home To Kintail“ is said to have been written at the Battle of Sheriffmuir during the first Jacobite uprising in 1715. We follow immediatley with a powerful old strathspey, Miss Drummmond of Perth, and finish up with some of our favorite reels. Jack is Yet Alive is a Shetland tune, and while Wind That Shakes the Barley may be of Irish origin, we couldn’t help but lilt and swing them both. We start this set with a fine old march composed in 1863 by Duncan MacDonald. We lead right in to two of our favorite old Scottish jigs. Mike then takes over on the D small pipes to end the set with three of his favorite reels. Three of Mike’s favorite strathspey tunes played on the low A smallpipes, accompanied only by Tom on the piano. We start this set with a famous old air, composed by Charles Grant (1806-1892). We follow up with two of the most engaging and energetic strathspey tunes we know. This prepares us to launch into one of the most famous reels on either side of the pond, Mason’s Apron. We learned this version, and it’s variation, from our good friend Scottish fiddler Paul Anderson. Our good friend and the one who gave Saucy Bess her name, Scottish fiddler Paul Anderson, has composed many fine tunes, and this is among his finest. Thanks you, Paul! James Scott Skinner (1843-1927) was a legendary fiddler and personality. “The Piper’s Weird” means “The Piper’s Fate” and one of Mike’s signature tunes. We couldn’t help but indulge in some studio ledgerdemain to fill out Mike’s two-pipe duet on both D and A small pipes to end our adventures.